Hi crafters! Welcome to the Echo Park and Imagine blog hop. For me, I am in Florida trying to survive Hurricane Matthew so any added prayers would be welcome as well lol!!! So, it was interesting to try and create projects with limited supplies. It is amazing to see how far crafting has come, but try and challenge yourself and use the basics. 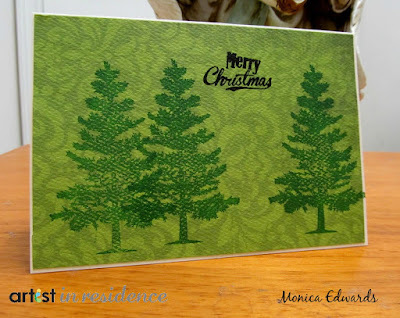 For my post I made a Christmas using Versacolor ink in Green Tea and Echo Park Haunted patterned paper and Tis the Season combo set. I also made this tag using the Haunted collection and added some Studio Glaze in Black to make the dots on the patterned paper and also outlined the house with Memento black ink for depth. I thought to use only simple things and the products on hand. There is a full lineup of amazing designers to get your creativity going and both Imagine and Echo Park will be giving away a a fabulous prize!! I hope everyone everyone enjoyed my post and thanks for stopping your last stop is the Imagine blog. 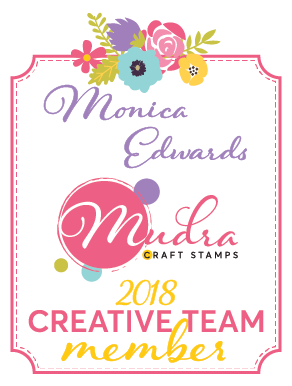 Monica Edwards - YOU ARE HERE!! That is a neat little haunted house. I am in Florida too! We are doing okay in Ocala so far. Where are you? Cute ideas! Sending prayers your way! It's great to see how, even with limited supplies, fun projects can still be made. Praying all goes well for you over the next several days. Please stay safe to all in the path of the storm. I really like both of your projects. Really fun projects Monica! Prayers to you as the east coast weathers Matthew, hope you and everyone is safe. First off, prayers you and your family are safe from the Hurricane. Second, your projects are great. I love the Christmas trees and the patterns you used. And that Spooky tag is Spooktacular. I love the patterns and details you created. Just great! Be safe! the tag is so cute! Love the card and the tag. I had never heard of Imagaine until this blog jump. Will have to visit there as well. Both are nice, but I really love the pinetrees!! I love your Christmas Card. It is very simple but elegant! I can't wait to try it. Awesome projects! Love the tree and the haunted house! Both great projects, I really love the Halloween tag! I love the simple Christmas card and the colorful Halloween tag. Both are great projects. Great projects with limited supplied! Stay safe in the storm! Listening to the wind and rain right now in SC. Great time for hopping since I still have power and internet. You have the holidays covered - nice job. Hope all is well. I love the spooky house tag. I love your spooky tag, the colours are great and your Christmas card is really beautiful too! Great tag, that haunted house looks spooky. I love that pretty Christmas card and fun Halloween tag! Wonderful use of the Echo Park papers! Glad you are safe. What a real trooper, to get projects done and posted during a hurricane. Lovely card and tag. Stay dry and safe. Wow! You were a busy bee! :-) I love the tag. I need to get busy with Halloween creations. Thanks for the Christmas card idea, too. I hope you didn't suffer any damage from Matthew. Such a scary thing. Love the projects! Such a fun tag! And a pretty Christmas card! These look great! Really love that tag! So much to love here. Both projects are wonderful! TFS!